The main mechanical components are the chassis, wheels, motors, connecting rod, cogs and bearings as well as various other small parts. All of which are carefully designed so that the whole assembly fits within a 7.5cm cube, as required by the FIRA regulations for this class of robot. Since 2003 when the Robot Football Project was taken over by fourth year engineering students, there have been significant mechanical advancements to the Evolution robots. 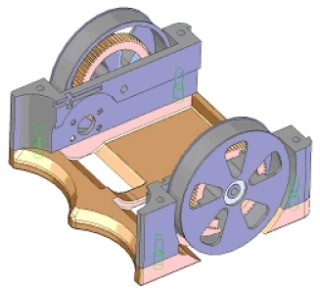 The design for the Evo 4 was modelled in the 3D CAD package, SolidWorks. The image to the left shows the refined Evo 4 chassis about to undergo testing, to simulate the loading that can occur in a front corner collision. The aim of which was to verify one of the new design’s objectives; overcoming a structural weak spot apparent on the Evo 3 design.